Growing up I remember my mom making batches of them for special occasions, or sometimes just making a few ahead of time–kind of like the idea of meal prepping. Traditionally, she made the meatloaf by wrapping each loaf in foil; then steaming them. For lunch, or dinner, I would simply have the meatloaf with rice (steam or fried) with a side of dipping sauce, such as good ‘ole ketchup with a dabble of hot sauce or with banana ketchup (the spicy one was my preference). 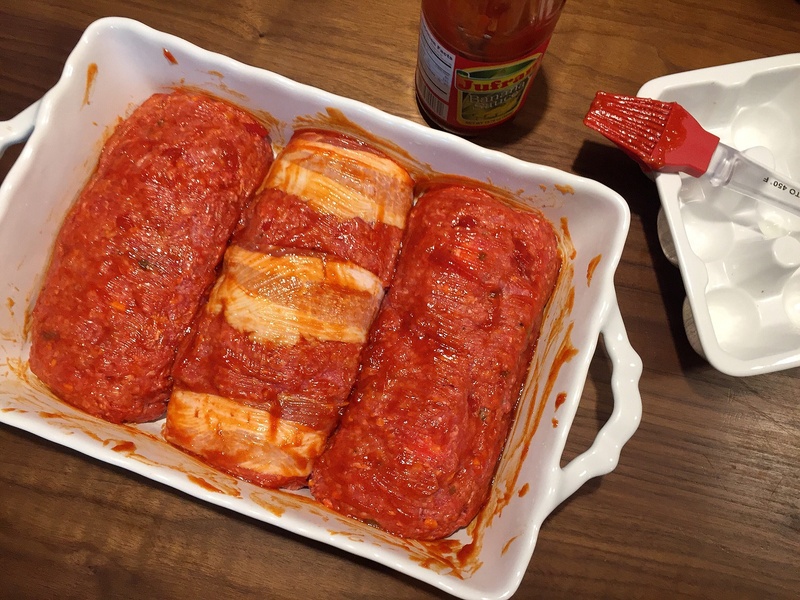 Today, what I have for you is my rendition of the Filipino meatloaf– baked, not steamed. 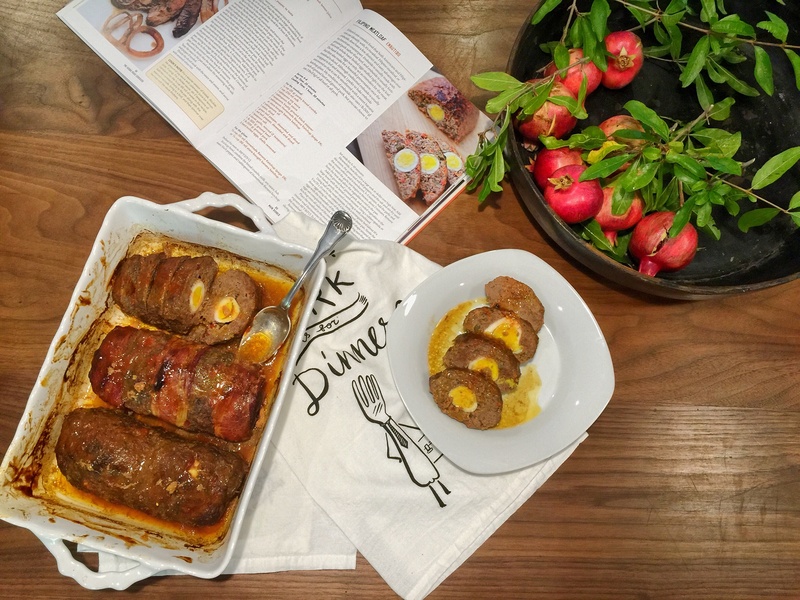 The original recipe was inspired from The Adobo Road Cookbook, pg. 83. Kosher or sea salt and fresh ground black pepper, to taste. 1. In a large bowl, combine the bread crumbs, milk, soy sauce, ﬁsh sauce, black pepper, and 1 tablespoon of banana ketchup. Set aside for 5–10 minutes. 2. In a second large bowl, combine the ground beef and ground pork (if using) with the dice carrots, onion, roasted bell peppers, sweet relish, garlic, salt, and fresh ground pepper. 3. Next, add the bread crumb mixture to the meat mixture. Using your hands (or a rubber spatula), gently mix everything until well-combined. 4. 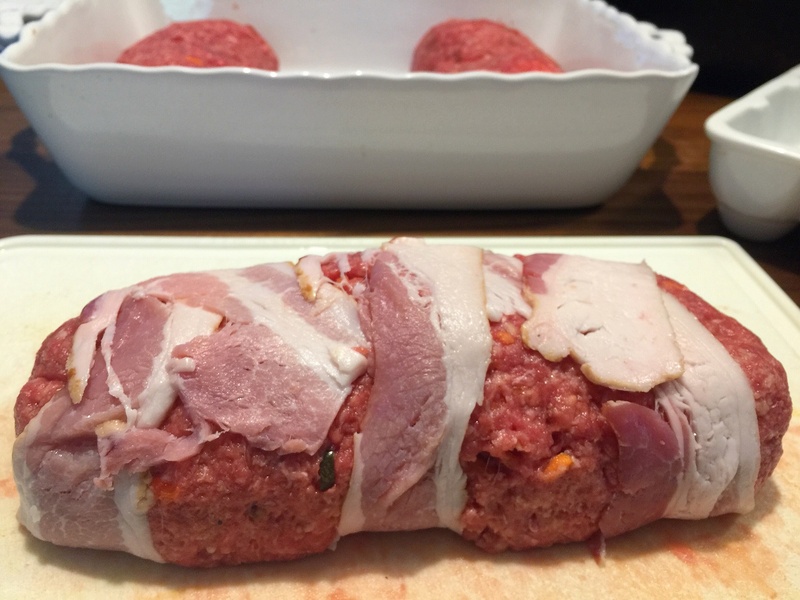 Divide the meat mixture into three parts. Next, form a rectangular bed (about 10 x 5 in) in the center of a large cutting board. Nestle two eggs along the center of the bed. 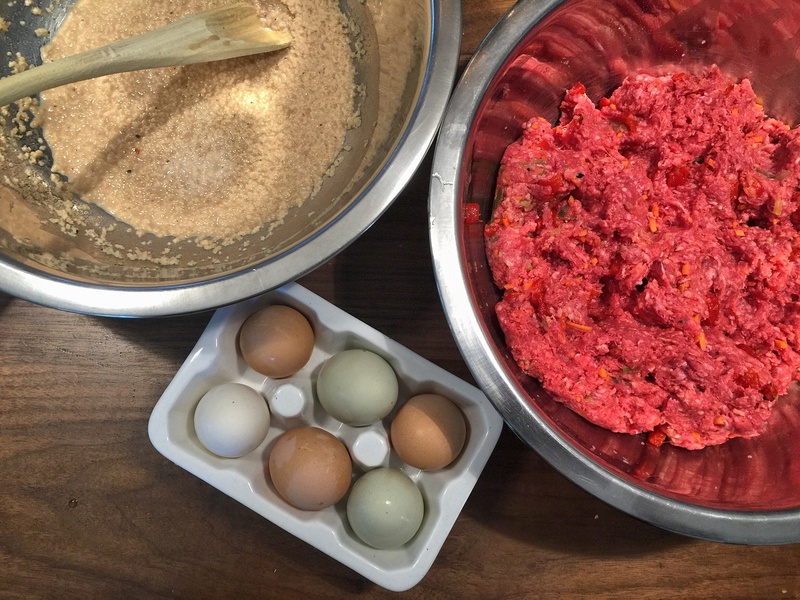 Form a loaf shape around the eggs with the remainder of the meat mixture, making sure that the eggs are completely enclosed. 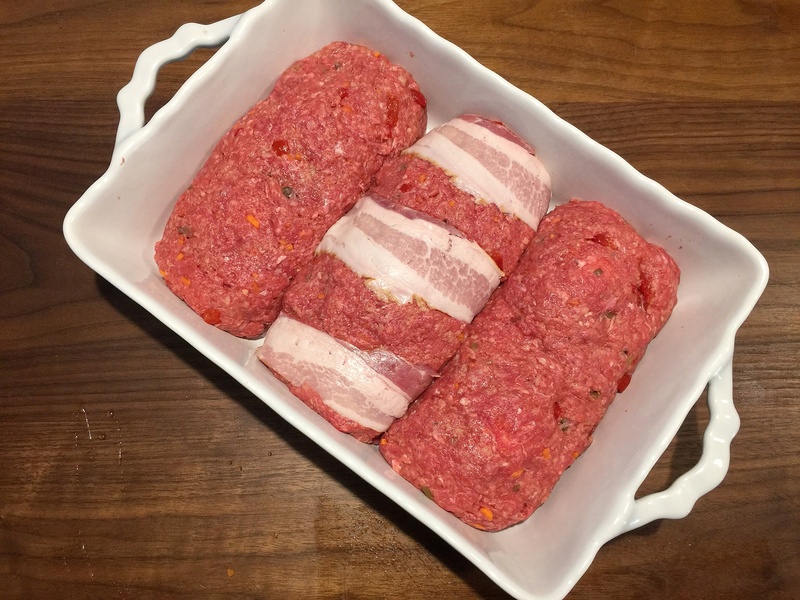 Wrap three pieces of bacon around the formed loaf. Do the same for the remaining two. Brush the 1/3 cup of the banana ketchup onto all sides of the meatloaf. Place the loaf onto a rectangular baking pan (about 8 x 12 in). 5. 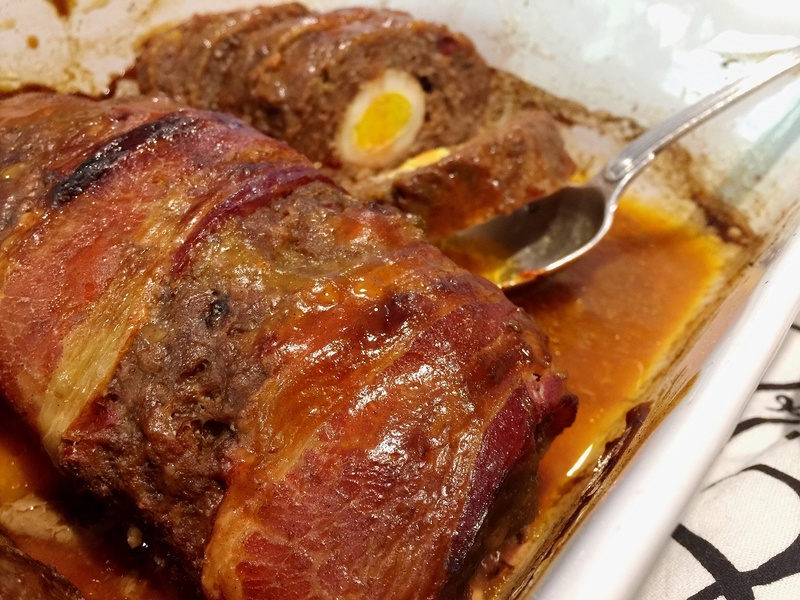 Place the meatloaf in the oven for 60–75 minutes, or until an instant-read thermometer (inserted into the meat, not the eggs) registers 145°F (63°C). To further brown and caramelize the glaze, place the meatloaf under the broiler for an additional 5 minutes. 6. Remove the meatloaf from the oven, drain out 90% of the liquid that formed from the meat. COOKING TIP: At this point, you can add additional banana ketchup/sauce onto the loaf, about 1/3 cup (mixed with about 2 tablespoon of water). Gently swirl the baking pan so that the natural liquid blends-in with the banana ketchup/water mixture. This will make for a moist meatloaf! Best served with steamed white rice. Salamat po and good eats! Posted in Entrees, Menu and tagged comfort food, Filipino Food, Food Culture, foodies, homecooked meal, homecooking, the cooking apprentice. Bookmark the permalink.